I had the pleasure this weekend of attending EcoHackNYC for the second time. It was a generous, brilliant, and fun group to join for a day of hacking. Sadly, this time, as last, I had public transit issues, so I did not make it for the Friday night ignite talks. There were a number of talks and topics; swing over to twitter and search for #ecohacknyc to get a tweety view of it. I presented a project idea on Saturday AM re: putting together mobile-ready field forms for performing plant community assessment protocol (PCAP). In short, plant community assessments allow us to make qualitative assessments of plant communities, so that we can distinguish between high quality, medium quality, and low quality habitats. The process stems out of the tradition of wetland monitoring programs from the State of Ohio, recently adapted for terrestrial ecosystems as well. The interesting thing about these protocols, relative to simple diversity indices, is that alike communities are compared. So, for example in wetland assessment, the wetland hydrogeomorphic (HGM) class is considered, meaning a high-quality fen will be compared with other fens, but not to a coastal wetland. This prevents high quality ecosystems of naturally lower diversity, lower plant sensitivity, etc. from being scored relative to systems that are naturally more diverse, and/or have more or a greater number of sensitive species. What I proposed at EcoHackNYC is that a group of us work on putting together tablet-ready field sheets to help streamline the data collection process for these datasets. Presenting at the last minute, as I had missed the ignite sessions, I got no nibbles on working on the project. 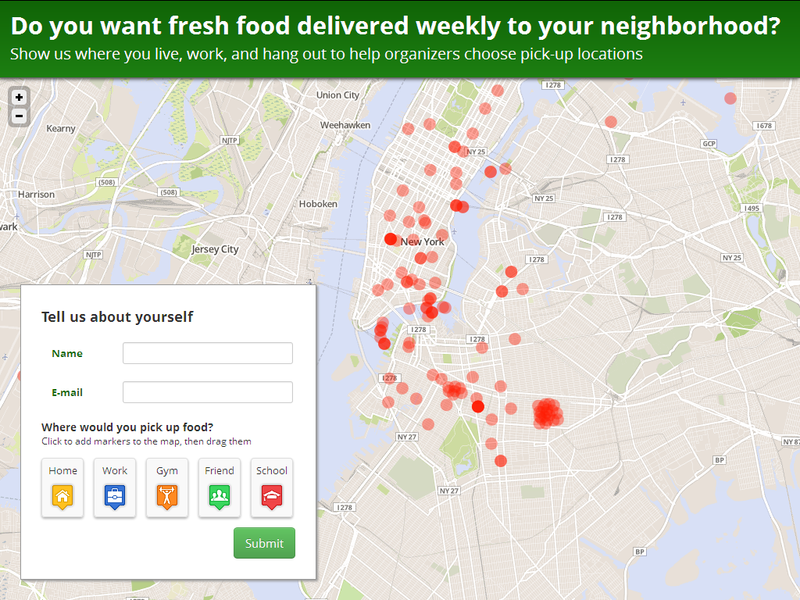 An interface for communicating local demand for community supported agriculture (CSA) through a simple map interface. It’s meant to be a tool to aid in the development of new CSA drop-offs based on local demand. You can follow the project on twitter @csabuilder. It’s built on Heroku for hosting, MapBox for map tiles, Leaflet for the mapping interface, jQuery for most everything else, and leveraging CartoDB for PostGIS goodness. In the interest of full disclosure, I wrote not a lick of code for this projects– I mostly just kibitzed and made snide remarks, while working on getting Open Data Kit (ODK) to bend to my will in developing field forms for the aforementioned PCAP project. I may have a forthcoming post on ODK, which was fun and easy(ish) to set up and deploy for creating Android form management. ← Quick narrative on the distinction between leadership and power… .